For most people, especially those who are serious about blogging, social networking and content marketing, working with graphics and images is an inevitable skill. Given that the art of making beautiful posters, blog pictures, social networking images, computer graphics etc., has reached a non-negotiable status, a lightweight, intuitive and FREE design software is necessary.That is why today I share with you FotoJet, a graphic design service that makes it easy to edit and design photos and create collages. It has many options to choose from: templates, text fonts, clipart images, effects or layouts. The advantage is that it allows you to use all the basic features and resource for FREE, no download or registration required. The collage feature offers hundreds of layouts, templates, backgrounds, effects and clipart images that you can choose from. It also has a simple functionality to customize the elements in the collage. Whether you are going to make creative collages or photo grids, FotoJet’s photo collage maker makes it easy and fun to express your minds. There is a library of preset layouts that you can easily customize. Choose any one of the layouts and edit with your creativity; then you can make amazing photo grids and classic collages. What’s better, you can also create a photo collage from scratch! Every moment of love is memorable and worthy of a stunning love collage. 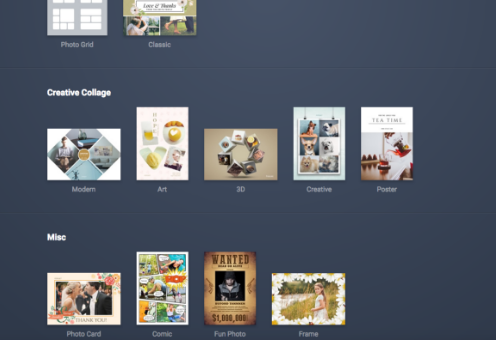 FotoJet’s online collage maker helps you memorize your love stories. From a heart shape collage to a Valentine’s Day collage, you can always find inspiration easily. There are situations when you need photo collages to remember some special occasions. Whenever you need birthday collages, wedding collages, anniversary collage, etc., FotoJet has the options to unleash your creativity. The design feature offers dozens of pre-made templates. You also have the ability to start from a custom blank template. You can then use photos in stock, text fonts, backgrounds and effects to personalize a unque and professional poster, flyer, banner, Facebook cover, blog header, etc. * Professional templates of social media graphics, posters, flyers, banners and cards are provided. Flexible and easy to customize! * There are 80+ fonts and 15+ text samples to choose from. Freely change font, size, color, style and effect to get an outstanding result. * Add photos from computer, Facebook or stock photo. Simply adjust size, color or apply effect to highlight your photos. * Hundreds of creative clipart images are the perfect additions to your designs including Love, Celebration, Lifestyle, Holiday and more! * Set backgrounds for your designs with 20+ artistic background images to enhance the appearance of your designs. * Saving your design as an image or sharing it via social media is just one click away. You can even directly print it out online! The FotoJet editor allows you to manipulate your favorite photos with ease. The tool offers a lot of editing tools, including crop, resize, rotate, effect, vignette, dehaze, noise, borders and frames. There are massive overlays in variety of styles such as grunge, cute, vintage, and montage to choose from, you will never feel bored with FotoJet, all you need to do is simple clicks and drags. Photo effects balance the colors, lights, shadows etc. FotoJet’s photo effects will add amazing touches, to make your photos black and white, vintage, Lomo or old style. Adding text to pictures has never been easier. FotoJet has designed a series of word art. They are creative combinations of colors, fonts, text effects. You can also take advantage of the text fonts that FotoJet offers! Overall, FotoJet is an easy yet powerful tool designed to help all commom users to turn their photos into wonderful photo artworks! Whether you are someone who works on a school project, a blogger or someone eager to set up a personalized card, FotoJet is a superb service you do not want to miss! Glad to read your informative post. As well as writing a post, it is important to pay attention to the graphic too. I think blogging is incomplete without graphics and images. I am also a graphic designer and love to make graphic. I have been using Canva for a long time for graphic designing. Thank you for refocusing about Fotojet. I would to like to use this amazing Fotojet.